You have just begun your first job as a technician in a research lab. Your boss has given you the job of subcloning a gene she wishes to work with, from an old style vector (pBR322) into pUC18 (plasmid maps). You have been given two strains of E. coli; one carries the source plasmid for GeneA, and the other carries the new vector pUC18. You have found two different approaches to subcloning; one is commonly referred to as shotgun cloning and the other can be called targeted cloning. You have decided to try both methods and compare the results, so that for future cloning projects you can choose the most appropriate method. Your have a book of protocols, but you need to plan a strategy, and use the appropriate protocols to achieve your goal. The basic steps involved in producing recombinant DNA are outlined in Figure 1. The basic steps involved in producing recombinant DNA are outlined in Figure 1. Plan the cloning strategy. This includes selecting a method for obtaining the DNA fragment to be cloned, selecting a vector into which the DNA fragment will be incorporated, and selecting the bacterial host that will be used to produce the recombinant DNA. Isolate the vector and the DNA fragment to be cloned. For the vector this may involve growing an appropriate bacterial strain carrying the vector, and isolating the vector DNA. The method used to obtain the DNA for cloning depends on where it currently resides (in a plasmid, in genomic DNA, in mRNA etc.). Prepare the vector and the target DNA for ligation. The DNA that will be cloned needs to be an appropriate size for ligation (size range depends on the vector being used) and the vector needs to be opened up (made linear) so that the insert can be ligated to it. This could involve using restriction enzymes or mechanical methods to breakup the target DNA. Vectors are usually opened up using restriction enzymes. Ligate the digested vector with the DNA fragment(s) of interest. 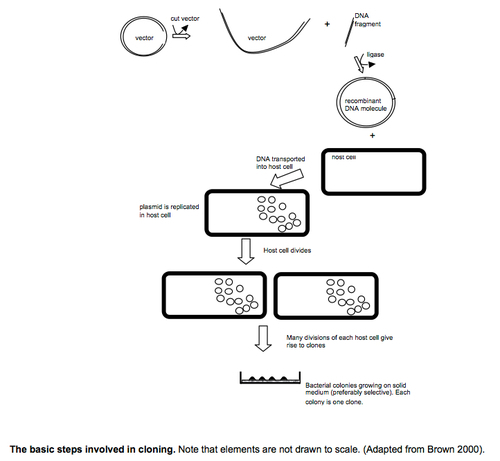 Screen the new plasmids to find the desired recombinant plasmid(s). This involves transforming host bacteria with the ligation mixture and using selection methods to isolate single bacteria carrying the newly created plasmids. Plasmids are then re-isolated and checked for correct structure. In order to plan a cloning strategy, you must first be familiar with the many available approaches and several molecular protocols. 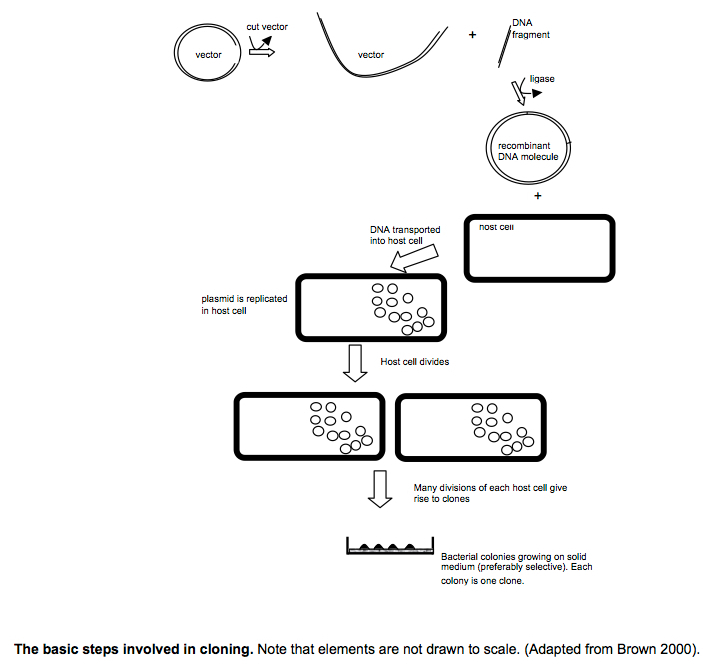 Since you are new to molecular biology the cloning strategy has already been laid out for you. However, by the end of the semester, you will be expected to be able to plan out your own hypothetical cloning strategy. The main things you need to decide before you start are what restriction enzymes you will use, what vector you will work with, what bacterial strain will be used for the transformation and what screening strategy you will use determine which bacterial colony carries the recombinant plasmid you want. A simple way to subclone from one plasmid to another is to use restriction enzymes. Knowing we have access to a plasmid carrying the piece of DNA we wish to clone, our first step is to look at the plasmid maps of both the source plasmid, pKC7, and the recipient plasmid, pUC18. 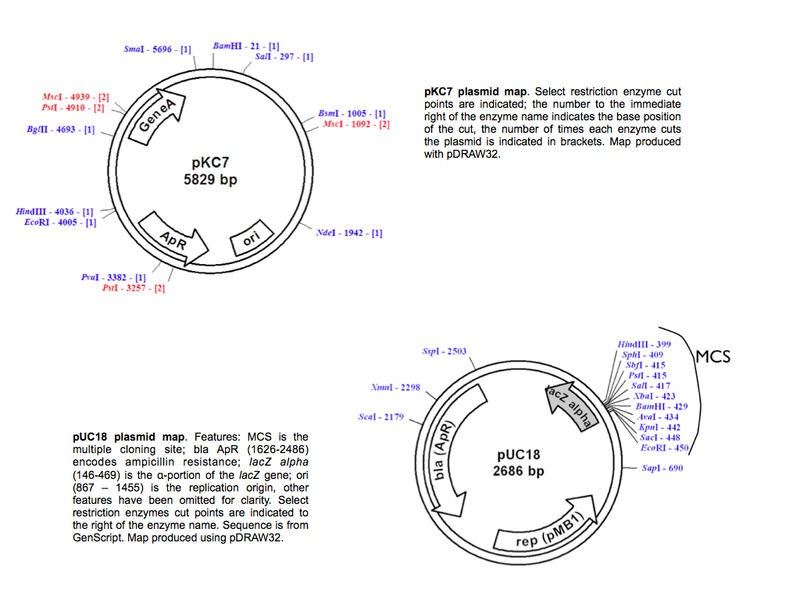 Plasmid maps typically show the location of important genes, cis-acting elements, and recognition sites of enzymes that cut the plasmid in one or two places (many other enzymes may also cut the plasmid in three or more places, but generally these are not useful for cloning purposes). The following criteria are used in selecting restriction sites for subcloning. Enzymes must not cleave within the DNA segment to be cloned. If possible, enzymes should cut the source plasmid only once. Enzymes should cut relatively close to the margins of the DNA segment you wish to clone. In particular, you don't want the DNA fragment to include any sequences that could interfere with what you want to do with the new clone. Enzymes must produce ends compatible with the vector MCS. Depending on the bacterial strain used to multiply the new plasmid, you may have to consider whether the restriction enzymes recognition sequence is modified or restricted in the recipient strain. Looking at the map of pKC7 you will note that recognition sites for Hind III and BamH I exist on either side of GeneA, but not within the gene. These sites also are found in the pUC18 MCS and therefore, are a good choice for the subcloning. Because we are using a different enzyme to cut each end of the insert, this is referred to as directional cloning In directional cloning the vector and the insert are cut with two restriction enzymes that produce different sticky ends, the sticky-ends are incompatible. Thus, the fragment can only be ligated to the vector in one, predictable orientation. This is in contrast to non-directional ligations where only one stick end is used and the DNA fragment can be inserted in either orientation. If orientation is important, further screening will be needed in order to identify the desired orientation. . The method used to producing starting material depends on what is available. The source plasmid, pKC7, and the vector, pUC18, are both available carried in E. coli strain DH5α. We simply grow the strains in liquid media and then isolate the plasmids from the E. coli. The amount of culture needed depends on the yield of plasmid DNA per mL of culture. Plasmid yield is primarily dependent on the plasmid copy number (the average number of plasmids per cell), which is controlled by the plasmid's replicon. A DNA replicon consists of the replication origin (the ori) and DNA encoded replication control elements. In plasmids, the ori and regulatory elements are usually found close together. Over 30 different plasmid replicons have been described but almost all plasmids used in molecular cloning carry a replicon derived from pMB1 (Sambrook and Russell, 2001). The naturally occurring pMB1 replicon has a copy number of 15 to 20 plasmids per bacterial cell. However, vectors derived from pMB1, such as the pUC family, carry highly modified replicons that can maintain hundreds of copies per cell. The plasmid pKC7 is a pBR322 derivative that carries the un-altered pMB1 replicon and under normal conditions, is maintained at 15 to 20 copies per cell. On the other hand, pUC18, is maintained at 500 to 700 copies per cell. The copy number of a plasmid is a key factor in determining the plasmid yield (amount of plasmid per ml of stationary culture). There are many different protocols for isolating plasmid DNA from bacterial cells but they all contain the same two basic steps: lyse the cells and separate the plasmid DNA from the other cell components. We will use a kit manufactured by Thermoscientific. This kit uses the tried and true method of alkaline lysis followed by neutralization to lyse the bacterial cells and separate the plasmid DNA from cell contents like genomic DNA, protein and lipids. The isolated plasmid is further purified using a silica membrane. The ultra clean plasmid DNA produced using this kit will be compatible with all downstream cloning steps. A molecular biology kit is a commercially prepared set of reagents for a specific protocol. Generally some of the reagents and/or the protocol is proprietary in nature and has been extensively developed and tested to make the protocol both simpler and more dependable than the ‘from scratch’ version. Think of a kit as a cake mix – except that kits usually produces a higher quality product than the homemade version. The next step is to digest the purified plasmids with the appropriate restriction enzymes; in our case these will be Hind III and BamH I. As with any enzyme, a restriction enzyme has specific requirements for pH, salt concentrations, temperature and cofactors in order to function correctly. Unfortunately, not all restriction enzymes have the exact same requirements. This means that when digesting with two enzymes, either the requirements for both enzymes must be met simultaneously or the two digests must be carried out sequentially. Fortunately conditions can usually be created that, while not ideal for both enzymes, will allow both enzymes to function well enough to get the job done in a single digest. Once digestion is complete the fragments must be prepared for ligation. As mentioned in the project outline, we are going to use and compare, two different methods for recombining the plasmid fragments. In the shotgun cloning method, all the pieces from the two digested plasmids are combined in a single ligation reaction. In the targeted cloning method the desired DNA fragments are separated from the unwanted DNA before the ligation reaction is setup. For our experiment, the pKC7 fragment containing GeneA will be isolated using gel purification. This method involves separating the restriction fragments on a gel, cutting out the desired band and purifying the DNA from the gel slice. To gel purify the fragment we will use a kit produced by Qiagen. In order to create a functional recombinant plasmid, we need to covalently join the restricted pieces together using the enzyme DNA ligase. As with all enzymes we use, ligase is naturally occurring. In vivo, DNA ligase is used during DNA synthesis to join DNA ends in lagging-strand synthesis of DNA. The DNA ligases commonly used in cloning originated from either bacteria or from bacteriophages. DNA ligase catalyzes the formation of phosphodiester bonds between adjacent 3'–hydroxyl and 5'–phosphoryl termini of nucleic acids. Luckily this is exactly the kind of ends left by the restriction enzyme digestion of the DNA. Note that the 3' OH and 5' P must be close together. This is why overhangs must be complementary to each other, allowing base pairing which brings the ends of the molecules close together. Ligation reactions often produce more than one product and screening is required to find the desired recombinant. Screening involves three main steps: transforming bacterial cells with the ligation products, selecting for bacteria carrying recombinant plasmid, and checking the plasmids to make sure they carry the correct insert. Transformation refers to the process whereby cells uptake 'naked' foreign DNA. When cells are amenable to transformation they are referred to as competent. Occasionally, transformation occurs naturally, but most bacterial species need to be made competent by chemical or mechanical treatments. We will use the traditional calcium-chloride method to produce competent cells. In any transformation experiment, only a subset of the bacteria will actually take up DNA. This means we need a way of quickly identifying which bacteria are transformed. All cloning vectors carry some type of selection marker. Often this marker is a gene encoding antibiotic resistance. Following transformation, the bacteria are plated on the appropriate selective medium (the antibiotic in the media must match the resistance gene encoded by the plasmid). Only bacteria that are transformed with the vector will be able to grow on this media. Our vector, pUC18, carries the gene for ampicillin resistance (β-lactamase). Depending on the vector chosen, we may also be able to screen for bacteria that carry a recombinant vector (vector containing an insert in the MCS). In our case, visual screening is possible because the vector pUC18 carries a lacZ gene fragment. Bacteria carrying an insert in the pUC18 MCS will produce white colonies when grown on media containing X-gal. If no insert is present, the colonies will be blue. Please see the page blue/white screening for important details on how blue/white screening works. Finally, once you have narrowed down the colonies likely to carry the desired recombinant, the recombinant plasmids harboured by the colonies must be directly screened. Even when you expect only one recombinant type, it is important to confirm the correct construct is present, as visual screening methods are not 100% reliable. Often the recombinant plasmid will be used in many experiments, and you would hate to find out several experiments down the road that you had not constructed the desired clone. There are several approaches to screening the recombinant plasmids; we will use restriction mapping. Because we know the maps of our starting plasmids, we can predict the sizes of fragments that will be produced when we digest the desired recombinant. It is simply a mater of choosing restriction enzyme(s) that will produce a diagnostic set of fragments (visualized using agarose gel electrophoresis).